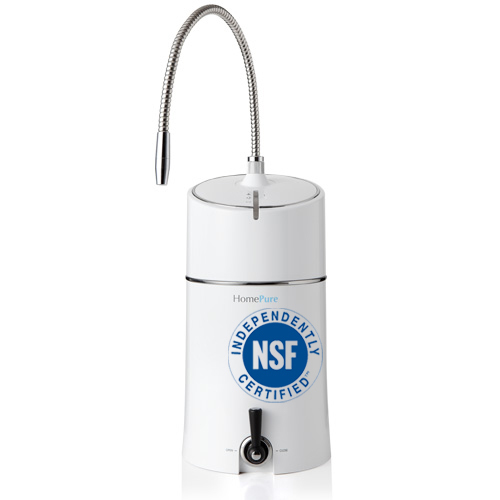 The water filter can only be used with pre-filtered water from a water supply facility. The filter cannot be used with water from unsafe water sources such as rivers and wells. Use of a quality pre filter is recommended to extend the shelf life of the cartridge. Why Do We Need Water Purification? With knowledge thus comes choice. A good filtration system installed in your home is one important way to proactively monitor and ensure the quality and safety of your drinking water. And although water purification technology for households now prevalently exists, many people are unaware of the working principle behind the various filtration systems. The first thing to keep in mind is that a purifying method cannot find its application in a single filtration stage. Only a good complete system can produce high-quality, safe drinking water. CAUTION: Do NOT use the HomePure Water filter with water temperature above 35°C. The company shall not be liable for any damage, deterioration, or malfunction resulting from misuse or failure to follow instructions supplied with the product. There are a number of purification and filtration products that employ various methods such as Reverse Osmosis(RO), Ultraviolet systems(UV), etc. It is widely held that Ultrafiltration (UF) systems are perfect for household water filtration applications using pre-treated water and has advantages over RO or UV filtration. HomePure water filter produces water that is naturally balanced because it allows natural trace minerals to pass through filtration, whilst ensuring contaminants are filtered out. Pi-water was discovered in 1964 by Dr Akihiro Yamashita during his study of botanical physiology. Dr Yamashita was trying to establish if hormone-like molecules were responsible for triggering flowering in plants, a phenomenon he and fellow scholars named as Florigen. He later found out that the change from bud to a flower was caused by ‘body water’, which contained a very small amount of Ferric Ferrous Salt (Fe2Fe3), the key element in controlling various functions of living bodies. After many studies and extensive research, Dr Yamashita succeeded in creating a bio-water with special properties that helped plants thrive well beyond normal expectations. He named this ‘Pi-water’. Pi-water is created by adding Ferric Ferrous Salt (Fe2Fe3) to water through ceramics. When Fe2Fe3 is added to tap water, it suppresses the increase of excessive free radicals. This is what HomePure water filter does to provide you with Pi-water. 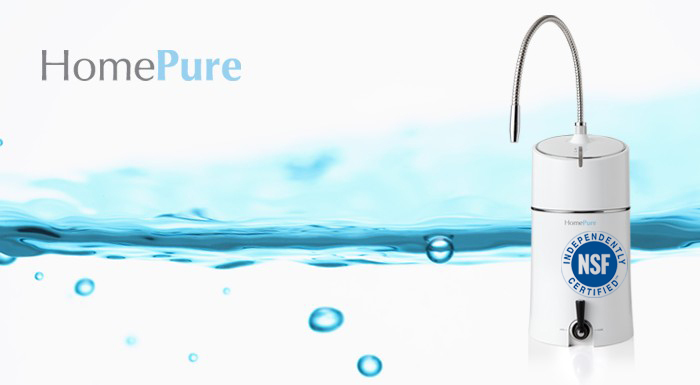 HomePure is a high-quality water purifier that incorporates a mechanical seven-filter media Ultrafiltration (UF) system, meaning seven filter stages are combined into one single filter cartridge. The well-selected filter media and its specifications allow for a clean and safe filter performance that ensures water is purified and filtered. Made of PE net and two-layered non-woven fabric material, the pre-filter effectively filters suspended solids such as rust residues, mud, and sand larger than 5 µm (5/1000 mm). The carbon ceramic balls are made as special coating balls at a low-temperature process under very technical and delicate methods to keep all the benefits functioning inside. The balls are responsible for improving the taste of your water, promoting excellent absorption and deodorisation. The tourmaline ceramic balls reduce water clustering and have antibacterial and deodorising qualities to better purify water. These help give water a good taste and are a good source of mineral microelements that are beneficial for wellness. As the size of the smallest bacteria is 0.2 to 0.3 micron (a hair size is around 70-140 micron), the HomePure Ultrafiltration (UF) membrane ensures elimination of bacteria due to its hollow fiber membrane having a pore size ranging from 0.01 to 0.1 micron. Microscopic impurities are likewise filtered out. However, the UF membrane allows the passing through of beneficial water minerals. Made of inorganic compound materials, the antibacterial Silver-lite stone is effective in preventing bacteria and algae growth due to its Silver ions (Ag+) that move throughout the filter. Hence, the remaining water in the filter does not become contaminated and bacteria is prevented from re-entering the filter. 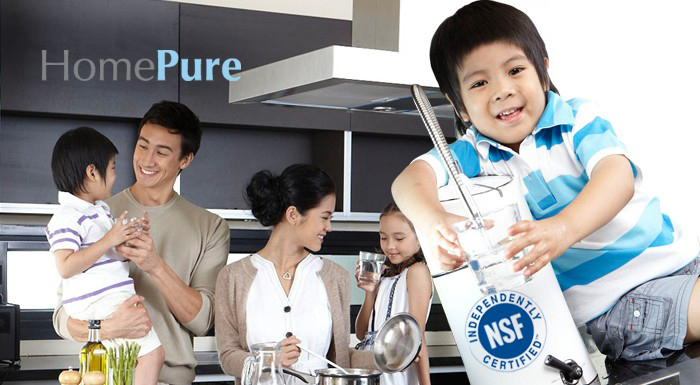 The HomePure Water Purifier CANNOT be used with water temperature above 35°C. HomePure should only be installed using tap water source (pre-treated water from metropolitan water works). Using HomePure with underground water will quickly clog the cartridge and thus affect drinking water quality. Remember that the original hardness of underground water can sometimes be up to 3000 ppm, and the HomePure water filter is not designed for this hardness. The inlet water pressure for HomePure is 1 bar to a maximum of 4 bars. Higher than 4 bars may cause unit overflow or damage to the filter cartridge. If your tap water is very dirty, for example, yellowish colour with visible dirt content, then we encourage you to use a pre-filter which you can normally obtain from any regular supplier in your country. A pre-filter may help extend the lifetime of your HomePure filter cartridge and prevent premature replacement caused by the heavy clogging. In case you plan to install a pre-filter onto your tap water inlet source, make sure you choose a trusted product and change the filter cartridge timely as suggested by its manufacturer. 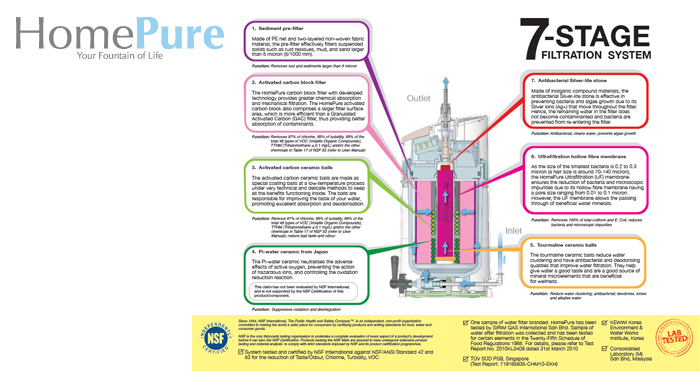 Failure in doing so may lead to contamination of the inlet water before it gets into the HomePure system, thereby causing the system to work harder. If water does not come out from the unit, the first thing to do is to check the pre-filter conditions. The estimated lifetime of the HomePure filter cartridge is 12 months or 4320 L, but this depends on the water quality in your location. In case you have bad tap water quality, the filter can get clogged before its estimated lifetime, even when the indicator appears to work normally (this is because the programmed 12 months or 4320 L limit has not been reached yet). In this case, if you use a pre-filter, follow #3 above. After that, if water still does not come out from the unit, then you must change the filter cartridge. Do not forget to reset the system (refer to the HomePure Manual) after you have replaced the cartridge. As indicated in the HomePure Manual, we would like to reiterate and emphasise that before taking out the filter cartridge, you must stop the diverter valve, open the front valve, then plug out the inlet plastic tube. After that the filter cartridge can be removed easily by pushing on the ejectors. If one of the abovementioned steps is not followed, it is almost impossible to take out the filter cartridge because of the suction of water inside the unit. When you change the filter cartridge, please do not twist the cartridge into the adapter too strongly. Just turn it until you feel it is tight, and that is it. Turning the cartridge too strongly will cause the neck of the filter cartridge to crack. If none of the adapters and O-rings can fit onto your sink’s faucet, inquire with your local pipe technician for a rubber adapter (common in most of the countries), otherwise, please follow the suggestion of your technician on how to fix it. Last but not least, after you have filled up your HomePure water filter, when you need to move it, carry and place the system in its new location carefully and gently. After you install the water filter or change the filter cartridge, let the water flow for about 10 minutes (make sure it is 10 minutes, please do not worry for the cartridge lifetime) before you can start using the filtered water. If you use filtered water again after a day, let the water flow away for 10 seconds before using it as your drinking water. Do not clean the filter cartridge inside the unit. It is designed in the close loop that you will always get clean drinking water in its service lifetime. CAUTION: Do NOT use the HomePure Water Purifier with water temperature above 35°C. The company shall not be liable for any damage, deterioration, or malfunction resulting from misuse or failure to follow instructions supplied with the product.